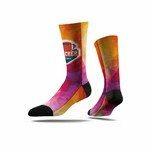 Combine style with fun with this psychedelic full color Unisex Crew Socks. Its heelless design is easy to wear and one size fits almost all. Add a dash of fun with this funky full color Unisex Tube Socks. Its heelless design is easy to wear and one size fits almost all. Your business logo, advertising slogan, or custom artwork can be displayed in full color on both sides. Each sock starts as a pre-knit base of a white sock with a black heel and toe. Your business logo, advertising slogan, or custom artwork can be displayed in full color on both sides. Graphic does not stretch when worn. Your business logo, advertising slogan, or custom artwork can be displayed in full color on both sides. Your logo will never stretch when you wear. Your business logo, advertising slogan, or custom artwork can be displayed in full color on both sides. 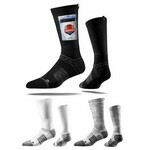 The utility sock is a great sock with built-in functionality.